We are seeing solar energy as salvation, both for a cleaner world, and as an energy resource that will last, and best of all, we are on the threshold of it being economically competitive with fossil fuels. South Dakota has a great solar resource, as our great crops and grass demonstrate. However, all the renewable energy news is about wind power, and how the lack of power line capacity is holding up the potential for development. No sense putting up wind farms, if we don’t have the line capacity to haul the generated electricity to big energy markets. But with photovoltaic (PV) panels using the sun, we can make a fair amount of our electricity on roof tops, front yards, or mounted on city utility line poles. We can make significant power where we use it, during the day when we use it. Many other states have figured this out, have voted in incentives, and are actively installing PV, which is a great boost to their energy mix. PV has helped immensely where population growth wants more electricity, but no one wants a new power line crossing their view-shed to haul the extra electricity. Getting solar where it is today has been a long road, and I’ve walked most of it. As a young man in 1975, I got interested in a solar career. It was mostly thermal solar then, and I decided to get the nuts and bolts experience working as an apprentice plumber, then to finish college in mechanical engineering. I took an evening plumbing codes class, led by an instructor that was a 40 year plumbing veteran. One night after class, I cornered him with all my solar ideas and he proceeded to stomp some of the enthusiasm out of me. Basically, he told me that after 40 years in plumbing, he didn’t want any part of the then engineered panels, cycling water where at times the water had any possibility of freezing, or boiling, where both could rupture expensive copper and aluminum equipment, and have water pumping out somewhere between the roof and basement. I decided on a different direction, the oil embargo ended, people flocked back to cheap mindless fossil fuels, and the infantile solar development slowed to a crawl. The industry had been young and booming so there had been some poorly engineered products put out, and more than a few people had bad experiences with the early technology which spoiled the flavor of solar for several years. PV panels largely came available to the public in the 1970’s, and I bought one from a hobby shop for $100 (1979 dollars). It was a toy. You can buy about the same thing today for one tenth the cost. It took until the early 1990’s for PV panel prices to get down where with a little idealistic reasoning I could rationalize buying again. Within a few years I had grown my system to 500 watts of panels, with the panels being about half the cost of the total system. The total system included panels, large battery bank, special DC refrigerator/ freezer, meters, breakers, inverter, and other misc. equipment. All this would cost you about $9000 today with inflation. On a really sunny day I can make around a kilowatt-hr. of electricity. This would power something that took 1000 watts of power (vacuum sweeper) for one hour, or something that took 100 watts (couple light bulbs) for 10 hours, or something that drew 10 watts (radio) for 100 hours. It would have been a fair amount of electricity 70 years ago, but today Americans typically burn through many times that much in a day. If you are living independent of the grid then you have to bank some of those 1000 watts for days when the sun doesn’t shine. And of course nothing is 100% efficient, so there might be 5-15 % loss in the batteries, wiring, inverter, and whatever other equipment you are using. I don’t want to discourage you here, as I think that with the right incentives, installers, and homeowner enthusiasm PV can be a positive experience. I think many people would be happy with a grid tied system. A grid tied system uses the power line to your house allowing for two directions for electricity to flow. When you produce more then you use, your power goes on to others to use, and if you are using more then you are producing, then it flows from the grid into your home. Here you have some extra cost for interfacing with the power company, but it would be much less than the batteries in an independent power system. A family that is fairly flexible and has a modest power demand could get a nice safe grid tied system installed system for $30,000. A lot of the cost in a totally independent system is in batteries and optional backup generator. My battery bank for my little system cost over $2000, and a sine wave backup generator that will run small and medium loads, or keep a battery bank charged is over $1000. So you can’t go out and buy a solar system that will provide carefree electricity for your every whim for $9000. We moved to a remote home and lived totally on this system for a few years, but my wife at the times comment was; that it was a little like camping. Today I have a half dozen freezers to power for my grassfed beef business, so I’m back on the grid, but I actually like the challenge and discipline of being off the grid, so I’m keeping my energy habits lean (power bill $35 a month, which runs the freezers, hot water heater, stove, lights, fans). As soon as I get the grassfed beef business where it doesn’t take all my time, I am plotting how to sever the electrical umbilical cord. The first task will be to handle the sizable freezer demand off the grid. I’m thinking about a large super insulated walk-in freezer built into an earth berm using phase change salts, frozen by pumping air through the walls in mid-winter. The large salt water mass melts at temperatures well below freezing with the phase change from solid to liquid would consume an incredible amount of heat cooling the surrounding air inside. It would likely stay below freezing all summer, but to make sure, I’d have all the extra power (power after the batteries get full on sunny days) from the PV system go to additional cooling of the mass. 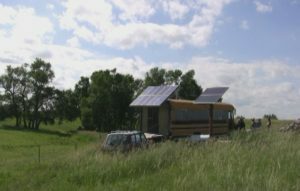 There is a vast range of systems for people living off the grid, everywhere from $500 for a really rugged commune with nature type, to over $200,000 to those that have to have Air conditioning and all the bells and whistles. It depends on how much power you have to have, and how inflexible are you are about when you use it. 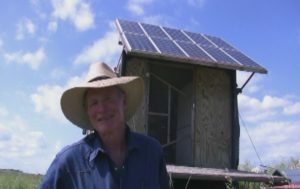 My argument for the smaller system is that there is embodied energy and resources in a PV panel, and although it has massive advantages over using other exploitative energy forms. The year we lived in a remote cabin in Tennessee we had a very basic lifestyle. The 500 watts of PV ran a super-efficient (expensive) 19 cu ft 1/2 refrigerator, 1/2 freezer, a few lights, tools, and occasional fan, and that’s it. It was sufficient to allow me to manufacture and retail a solar instrument called the Solar Pathfinder, and to not work the batteries to hard I mostly ran electrical equipment when the sun was supplying extra electricity. Here’s to a cleaner PV energy future.